I was going to title this post ‘Spaghetti Dinner’ or maybe the ‘Brechin Clan’ but I think ‘Que Pasa’ covers all that and more. We had a new visitor to the oranges yesterday morning and again today. 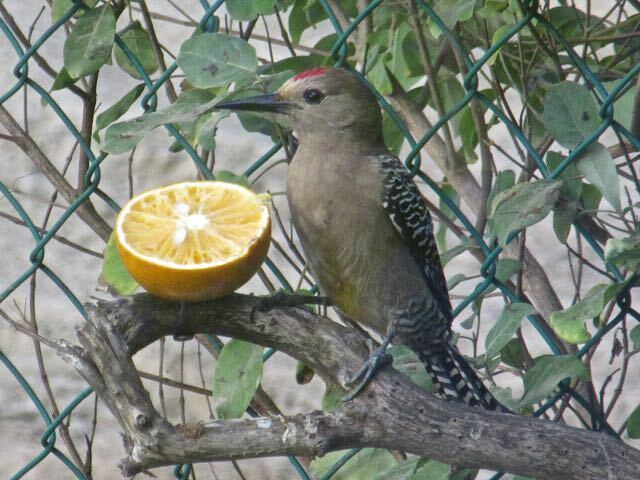 A male Gila Woodpecker, lovely to see. Eric came by yesterday to do some work for other RVers and stopped to show us his find. He did take the generator apart after we left Saturday. Because yesterday was a holiday he had not yet checked in with a radiator shop to find a new core. Meanwhile he brought us the fan belt to show us how close we came to disaster. Eric believes that we may have had a few hours left of generator use before the fan belt broke. At that point the generator would have seized and then we would have had no choice but to purchase a new unit at just over $10,000.00USD. 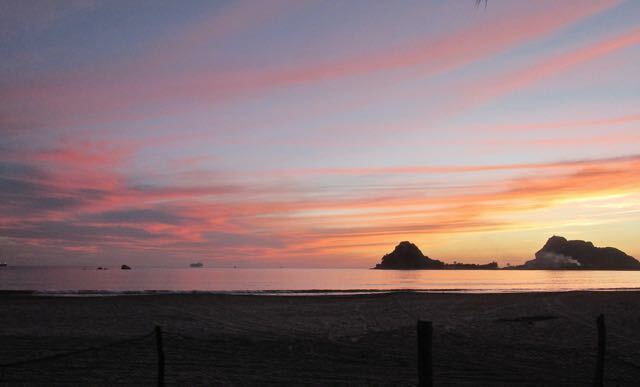 How very fortunate we are that this all happened here in Mazatlan. Last evening there was a happy hour and spaghetti diner at Camelita’s restaurant here on the Isla. 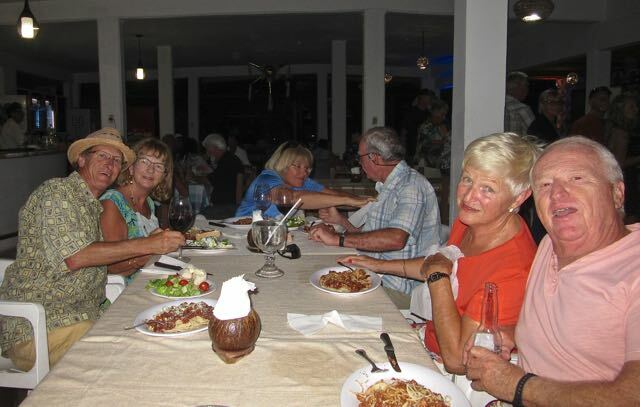 The meal is only 120 pesos/$6.30USD/$8.27CAD per person and includes the pasta dish with homemade sauce, a very fresh salad and bread and butter. The meal is prepared by an ex RVer who now rents a home here on the Isla. Carmelita’s offers the venue and discounted drinks. A lovely monthly event open to all on the Isla. Always difficult to get a good shot of moving people in the dark. 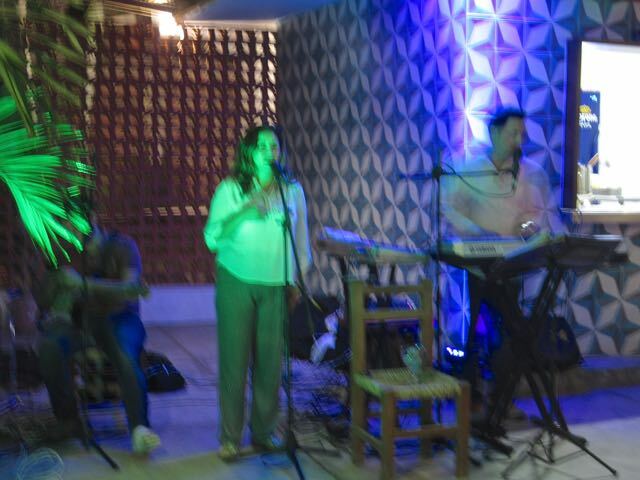 The band are from the Isla and they are very talented. They certainly had most of the audience up and dancing. So Alan and Laura can really dance. Who knew? We really had a great evening. 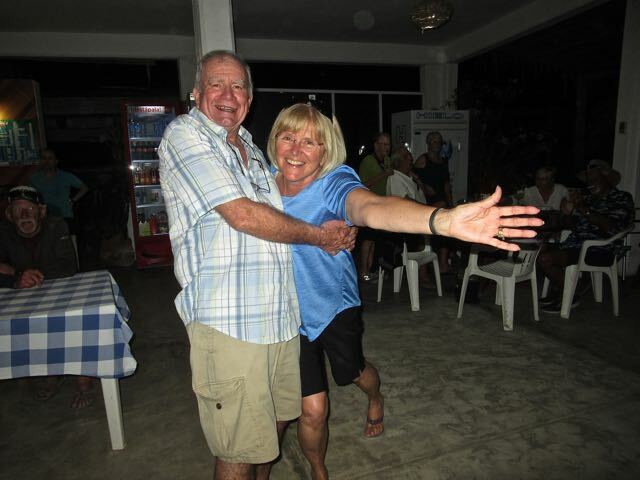 I even got to enjoy a dance with Scott who is a wonderful dancer. Scott is a son of our friend John who we lost to cancer years back. 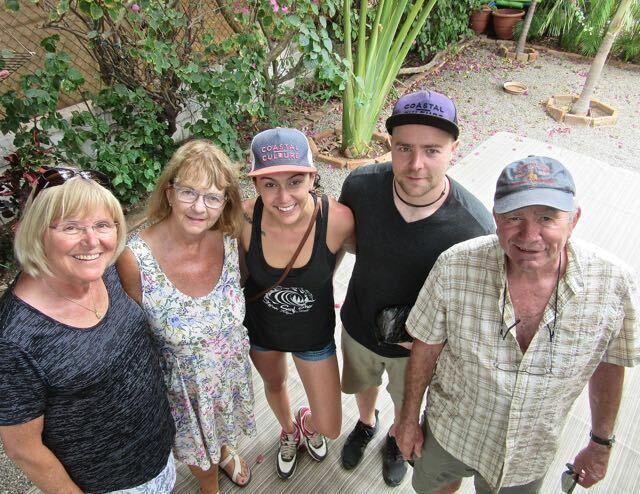 John and Alan were brothers, so now you might see the connection of all these special folks in our lives, the Brechin clan. 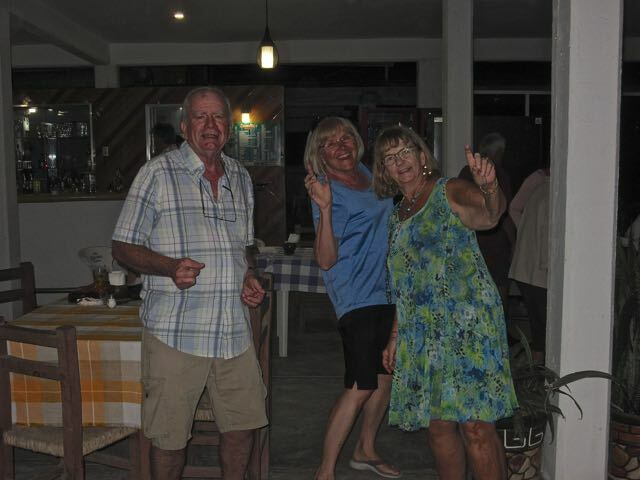 We RVed with John and his wife Pat many many years ago at Mr. Moro’s in Playa Los Glorious. Today we heard of the passing of George of the blog Tioga and George. He was a champion for Mexico and for RVers traveling here. George began blogging in May of 2003 and his words are still on his blog to read & enjoy his many adventures as well as to inspire many to travel. His unexpected loss reminds me and hopefully you my readers, that life is so very very precious and it is up to each of us to choose to live each and every day to the fullest as George did. You will be missed by many. 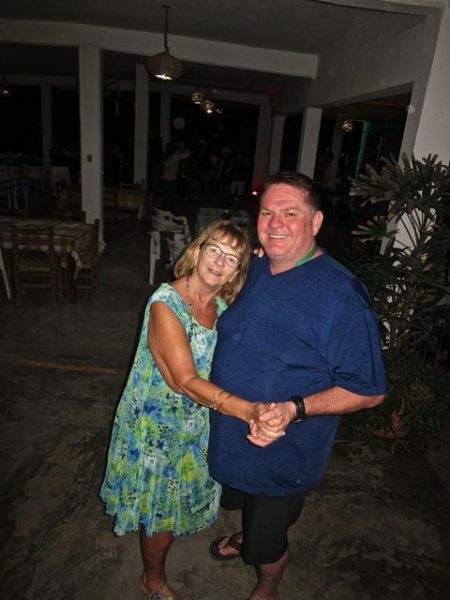 One of my fondest memories is a special dance I had with George at the Plazuela Machado a few years back. Laura, Alan, Colin and I walked back from the spaghetti diner along the beach with the aid of flashlights. But we didn’t want the enjoyable evening to end so we sat by our fire pit and chatted until almost midnight. We were so involved with our conversation that taking a photo was never a thought but again a new memory was made. This morning two more of the Brechin clan showed up. Kayla and her boyfriend Paul are visiting Mazatlan for a few days. Kayla was lucky enough to win tickets for two to Mazatlan. 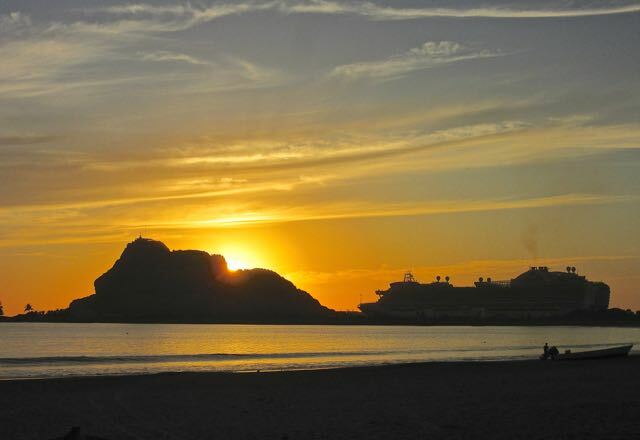 I know that we will be seeing more of them in the years to come as they have already fallen in love with Mazatlan. Hopefully Laura and Alan are going to get some free time to just sit and relax and to walk the beach. Once again the end to yet another perfect day here on the Isla. I would much rather be here for the winter than pass through on a cruise ship for a day. More fun times on the Isla. So many great memories of George and his adventures he sure lived his dreams to the fullest. So very very sad about George. We can only hope that he did not suffer at the end. I like to think of him having a great time wherever he is. I so hope that he is able to see all the love his blog readers are sending his way. Some good memories were made and you will have them always. Glad you caught the generator issue! Very fortunate. Continued happy times there on the Isla. Thank you, we only have just over 6 weeks left here and know that the time is going to pass ever so quickly. Good thing the Fan Belt Problem was found before it turned into a disaster. Great Food, Fun with Friends and Weather, how could you ask for more. Be Safe and Enjoy the Isla. We are so enjoying having our friends here. Yes, that was a disaster averted.